Keep the roots of some of your favorite trees perfectly watered using these DRAMM ColorStorm Tree Soaker Rings. 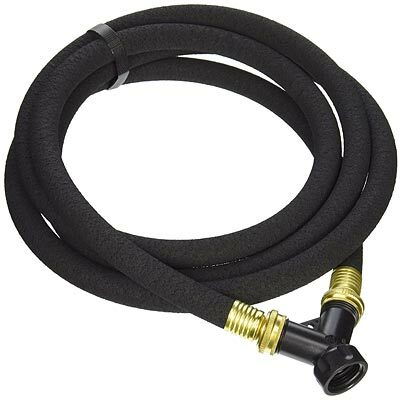 This fantastic set of 5 soaker hose rings perfectly surrounds a few medium to large trees, easily hydrating their root systems without losing water through evaporation. The porous body of each hose allows water to evenly and gently seep into soil, thoroughly watering the area around your established tree or two shrubs. This design eliminates geyser effect spraying to further prevent evaporation, and the rings may be covered with mulch for inconspicuous use. A Y fitting at the top of each piece connects to your outdoor spigot or a garden hose easily, while ensuring the units can encircle your plants. Their recycled tires and plastic construction enhances the environmentally friendly theme, and brass fittings add sturdiness. Steadily water trees or shrubs all year with these Tree Soaker Rings. Made in the USA. Lifetime guarantee. Note: This case pack includes 5 of the DRAMM ColorStorm Tree Soaker Rings, 10'.